At home, the 7 inch portable DVD player is perfect for a bedroom nightstand or end table, and the headphone jack means your viewing will not disturb others. The DVD player features a black outer casing with a silver handle and a black inner shell. You can watch for up to 2.5 hours with a fully charged battery with 3.5 mm headphone jack, or plug in the AC for endless viewing. This portable DVD player is ideal for travel, helping long trips fly by. Built in player controls, accessories and a remote (2 AAA batteries included) make this player as easy to operate as it is portable. The DVD/CD player is also compatible with CD R, CD RW, and JPEG discs, so you can watch movies or play albums, anywhere, anytime. The Magnavox brand originates back to 1917 when the worlds first moving coil speaker was invented in a lab in Napa, California. Due to this invention for the first time in human history the world witnessed a human voice that could be heard by an entire town. The product was named Magnavox which is Latin for Great Voice. It became a prime piece of US history and the foundation of a trusted brand for almost a century linked to dozens of notable achievements such as the first game console (Magnavox Odyssey) as well as world first plasma computer panels. Throughout the years our visual appearance took several forms relevant to its time. Ranging from multiple revisions of its initial appearance (the historic great voice featuring a lion head), a shield covering the history of the brand and its influence on entertainment, into a contemporary wordmark in 1982 and the wordmark it is today. The popularity of the Magnavox brand is as strong as ever before and its remarkable history attracts many fans and non profit organizations. KEY FEATURES: This DVD/CD player has a 7-inch TFT screen. It is DVD/CD/CD-R/CD-RW/JPEG compatible. There are built-in stereo speakers and a 3.5mm headphone jack and AV out jack. It also has a remote control, rechargeable battery and AC/DC car adapters. 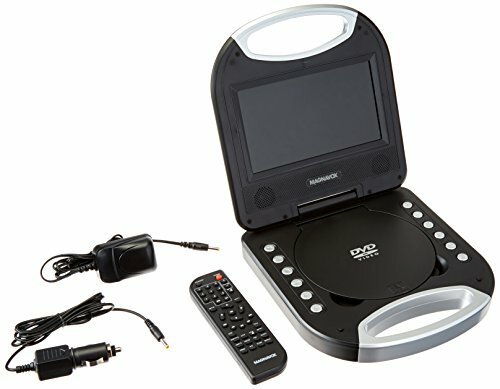 PORTABLE DVD PLAYER: This Portable DVD Player makes watching a movie on the go simple! This unit has capabilities to play music and view pictures from CD's. This player has a built in stereo speakers with a 2.5 hour rechargeable battery and AV out jack. COMMITMENT: Magnavox is committed to maintaining a clean environment. All televisions and computer devices recovered for recycling will be processed in a manner that complies with all applicable federal, state, and county laws and requirements. COMMITMENT: Just as the visual appearance of Magnavox adapted and remained relevant over time so does its identity and the quality it stands for. Magnavox is committed to maintaining a clean environment. All televisions and computer devices recovered for recycling will be processed in a manner that complies with all applicable federal, state, and county laws and requirements. PERFORMANCE: The Magnavox brand is ubiquitous on popular products found in households around the world. Even in today's rapidly changing markets consumers continue to choose our products to enjoy the values it stands for; high performance at a smart price.